This is the last in a series of comments CommunityAIR submitted on Wednesday, May 20, on the Proposed Environmental Assessment (EA) Study Design/Scope in what has been described by people with experience in such matters as a sham EA. CommunityAIR’s comments cover 11 subject areas, are extensive and pointed, and are best digested slowly. The first ten, listed below, are linked to their sites. Safety was enough of a concern 12 years ago that no less a personage than the Honourable Lisa Raitt transport minister in her role as president and CEO issued an EA notice for a bridge to address safety concerns. The call for a bridge came from an intergovernmental staff committee study which PortsToronto and its current EA seems content to rely on emergency preparedness to an emergency response. In other words, PortsToronto seems to believe that sufficient training can substitute for sufficient training and a well- planned response in an emergency. Now, there’s no bridge and there’s no emergency response study to determine the requirements for a worst-case scenario disaster involving a jet with an even greater number of passengers than carried by today’s Q400s. Even worse, the current EA doesn’t even contemplate such a study. [Page 32] Appropriate and sufficient emergency response and access in the event of a major disaster are essential components for any consideration of expansion. 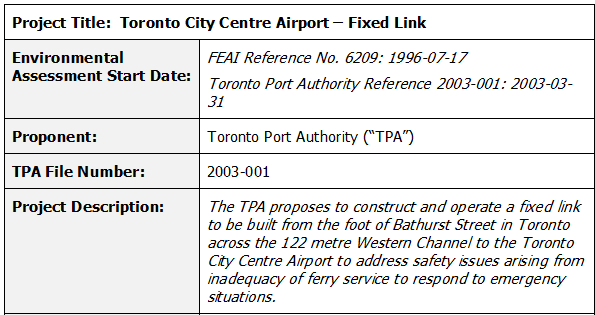 This document only sets out PortsToronto’s arguments, which ignore the 1993 experts’ report, previously delivered to Nicole Swerhun, that concludes that a bridge to the Island Airport is essential for adequate emergency access.